When you think of the Falklands you probably think of ‘that speck of an island somewhere far away’, the 1982 Argentine conflict and sheep. But wildlife? Spending two amazing weeks watching wildlife in the Falklands only came about by accident really. I had long held ambitions of visiting the Falkland Islands. The 1982 conflict was one of my first ‘News Story’ memories as a child. So when the opportunity arose to combine an Antarctic cruise with a day visit, it was a no-brainer. It was only then, when researching the cruise day-trips that I began to realise there was much more to this tiny UK colony than an Argentinian battle and a stop-gap to Antarctica. Two years later and it was all arranged. Flying from Brize Norton – another one of those ‘must’ experiences on the To-Do List – to the Ascension Islands for a refuelling stop and onto Mount Pleasant, Squadron Leader Smythe was our Head of Operations on the flight, in the event of us needing one. I will say though, the departure lounge was one of the most sobering experiences of my life. As my husband and I and a handful of other adventurous souls sat waiting in excited anticipation for our trip of a lifetime they called a flight to Camp Bastian. We stopped in our tracks for a second and looked around the room. There was a reasonable chance that not all these people here would make it home alive. The relevance to our destination was obvious. Eighteen hours later and we were there. The place I had heard and read so much about. We firstly had a couple of nights arranged in Stanley and a full day battlefield tour booked at the end of our trip but other than that it was really the wildlife that had prompted the visit. Penguins have always held a fascination for me. So clumsy on land yet they come into their own when swimming. My Falklands research had led me to a warden’s cottage on Volunteer Point where, following an appropriately grovelling email and a willing Cook, Housekeeper and Host of a Warden, one lucky pair could stay for the night. Although just three hours from Stanley, this was no ordinary drive. For an Ipswich town girl who moans about the pot holes along Ashcroft Road, these were proper bumps. I was so glad I had a guide doing the off-road driving, my nerves were shot to bits just being in the passenger seat. For Falklanders however, this is literally child’s play. Having made a quick introduction, it was finally time to head off to find penguins. And we did not really have to go far. Just outside the door in fact. Their burrows were everywhere. And then a whole colony. 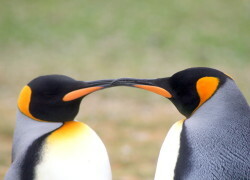 Gentoo’s. The little ones were only a couple of weeks old. So cute and fluffy. And unafraid. At a break in the penguin poop on the grass, we sat and observed. The youngsters quickly ran around, observing us as much as we were them. Pecking at our feet, were we edible? Then onto a King Penguin colony where many parents were guarding their unhatched eggs. As the sheep mixed with the cows who mixed with the penguins I had to pinch myself as I took in the sights before me. As the light faded and the sun set, I begrudgingly accepted it was time for some food. ‘Do you like tuna and pasta bake’ greeted our warden. Yes that would be great we both replied. As the adrenalin of the day subsided I decided I was actually quite hungry – having not eaten since breakfast (eating happens every day, penguin watching does not). ‘Oh dad’ piped up the son ‘that’ll be the fifth night on the trot we’ve had that now’. ‘Yes well that’s all I can do’ came the reply. Sitting contentedly in the tiny front room of the wardens cottage we realised it had been quite a day. ‘What time are we starting in the morning?’ asked my husband. ‘Sunrise’ came my definite reply. ‘Haha yeah good one, that’s about 5.30…. You’re serious aren’t you’ came the dawning realisation that when I said sleep is for the plane home I meant it. We had but one day in our life to experience what many see on the TV and dream of, I was not wasting one second of light. I told him to think himself lucky I had decided not to camp out in the pitch black. So as the alarm went off at 4.45am, the candle holder smashed in our haste to lessen the disturbance (electricity would only work once the generator had been fired up for the day), we crept around the house trying desperately not to wake our host but failing miserably as unfamiliar surroundings caused ‘ouch’ and ‘crash’ and the customary fit of giggles when it is not allowed. The excitement and anticipation was palpable. We had had such a fabulous afternoon and evening but this was the cherry on the cake. With a whole beach to ourselves, save the odd 500 or so King Penguins of course, we narrowly avoided breaking our necks as we scrambled in the half-light past Magellanic Penguin burrows, who squawked at us to leave them and their young alone. At 5.05am, we were ready. Having found a suitable rock on which to perch we waited. As the light came up they suddenly appeared. My heart stopped at the sight of dozens of majestic King Penguins as they appeared over the brow of the hill waddling eagerly towards the sea keen to embark on their fishing job for the day. Most ignored us completely. Those that did not were just curious. And one decided it would quite like a piece of our camera bag. We both held our breath, resisting the urge to reach out and try to touch, so keen for this to continue, so desperate to not frighten them away. This really was what life was all about for me. The stuff of far off dreams. The wind sweeping my hair into my face forced me to move. Startled penguins then had to contemplate ‘moving rocks’. Maybe the sea was safer – they quickly scurried off. With nothing else as a wind breaker to the Antarctic, the Falkland Islands really is one of the windiest of places. As the hours ticked by, all too quickly for my liking, its ferocity increased. Until it was too much for the poor penguins to get easily into the water. This really was a dangerous job. Their tiny bodies whipped about by the breaking waves. Once past the initial difficulties though they were off. ‘Bye bye little ones’ I said to myself, ‘take care’. ‘Shall we go then’ suggested my other half as other day visitors began to appear on the beach, a whole four hours later. ‘No – just to see the Gentoo’s dear’ at my look of abject horror that he suggest we leave. ‘But these are my favourites…. Oh OK then, just for a bit I suppose’. As for our other days, the wildlife was truly in abundance and easily accessible. We spent many a contented hour watching feisty rock hopper penguins ‘take a shower’ in the natural spring water, scouting out the elusive macaroni penguin and sunning ourselves with Gentoo’s porpoising in the water. 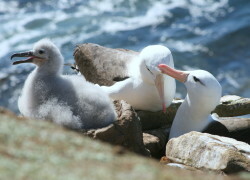 Apart from penguins, numerous Black-browed Albatross were protectively guarding their nests and young, inquisitive Striated Cara-cara met with Falklands Flightless steamer ducks and the endemic Cobb’s wren. From cormorants to storm petrols, sea lions to dolphins. For me it was the Galapagos of the Atlantic. As ever, all too soon time to leave. We were back in the military airport hangar of Mount Pleasant reflecting on another magnificent trip. The whole Falklands experience, island hopping, the calming isolation, the amazing people, the ‘airports’, – another story in itself. It did though have one further unique twist left. ‘I’m sorry to announce a delay to your flight’ came a voice over the loud speaker, ‘your incoming plane has just hit an Upland Goose which has damaged one of its engines’….. Believe me, only in the Falklands. 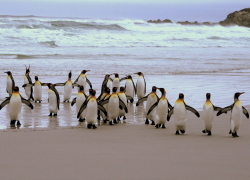 The climate in the Falklands lends itself to visiting during our winter, their summer. Depending on the wildlife you wish to see, in particular the hatching of the young, this largely determines exactly when is ideal. There are also excellent itineraries for those wanting to learn about the Falklands history and culture. Our guide really made the fields come alive with his highly researched account of the man-to-man battles at San Carlos. Trips can be tailor made to suit or there is also the possibility of joining an organised small group tour. Flights depart from Brize Norton twice a week or Chile once a week. 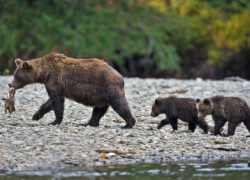 If time is scarce but you still want to see the brown bears, wolves, polar bears, whales and bird life, there are plenty of opportunities within our own European continent. You just need to know where to look…. Lots of seals to see here. 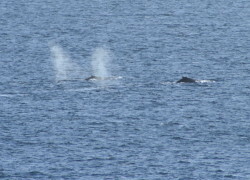 Whales migrate through the northern countries, so a good area to view different species. Wolves roam in packs through the forests hunting for wild boar. Fantastic fishing is also a must in the plethoria of islands and inlets that make up Scandinavia. Kakadu National Park will give you the opportunity to get up close and personal to a large variety of animals that you will not be able to see anywhere else. The cunning of the saltwater crocodile, lots of splendid birds. The Northern Territory and Kimberleys has the 12 most deadliest snakes, spiders and sea creatures in the world. 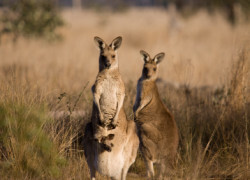 Watch the kangaroos stand up and box each other for supremacy. Parrots and Cockatoos squawk overhead, flying past in an abundance of bright colours. Wake up a slumbering Koala. See the amazing duck billed platypus cavorting in the water. Known as the ‘Galapagos of the South’ this is a truly spectacular destination for those that love wildlife. Share an isolated beach with just your loved one and a King penguin colony, observe seals, cormorants, albatross, cara cara, dolphins and whales – the list is extensive. The only request is that you take nothing but photographs and memories and leave nothing but your footprint…..
A true hunting, fishing and wildlife environment. Vast wilderness with fantastic glacial rivers for catching trout and salmon. Lumbering moose push through the dense undergrowth with massive antlers. Bears busy looking for a free meal in the rivers and forests. Choose to travel independently on a fly drive holiday or be fully escorted to enjoy the best of Canadian wildlife. Glide past glaciers whilst watching for whales, enjoy the antics of the seals as they covort in the sea. 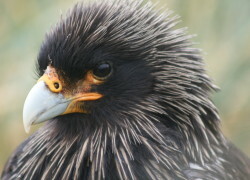 See soaring birds high above the mountains and laugh at brown bears as they try to catch the leaping salmon. A photographers paradise. A huge continent. Choose to view the vast plains of the Serengeti, marvel at the Masai tribes herding their cows in the company of lions and elephants. 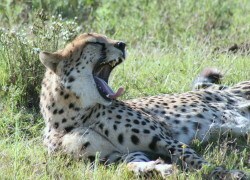 Be amongst the animals in your own lodge or tent with all the luxury of a hotel. Spot rhino, leopard, buffalo. Endure the perils of the wildebeast on migration through the hazards of the African plains.